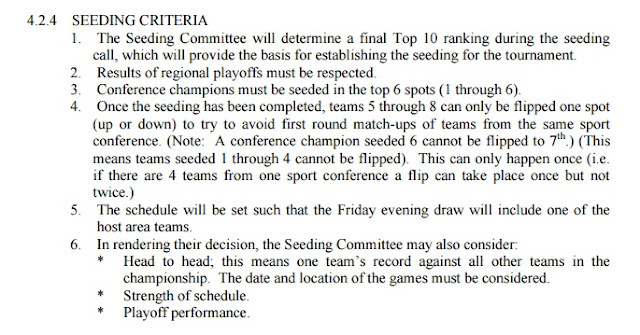 Live it, learn it, love it: following university hoops means knowing the seeding criteria for the Final 8. Over the next six weeks, the goal will be to keep up on the chalk picks for the men's basketball nationals, which are March 9-12 at the arena formerly known as the Halifax Metro Centre. Carleton, of course, is 7-of-8 at winning nationals held in the East Coast, with the only loss coming in their first trip in 2001, when they lost in the quarter-final against McMaster by the margin of a buzzer shot after a disputed out-of-bounds call. There is a lot of basketball to be played before it becomes evident, once again, that the field is playing for U Sports silver and bronze medals. Out west, did you see what UBC did on the weekend? who ends up as the 2 seed, the OUA runner-up or Canada West champion? That also determines the matchups for Canada West's other representative and the OUA third-place team, assuming it receives the wild card berth. 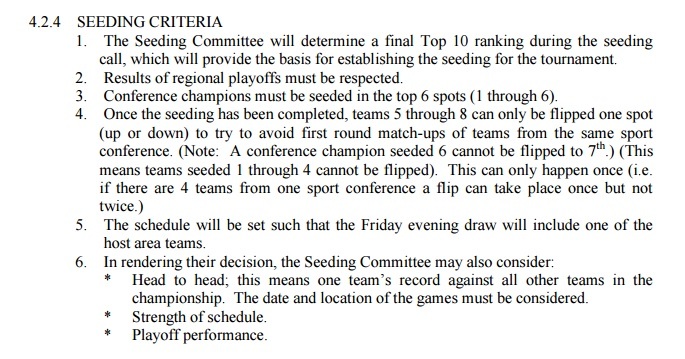 The rules will dictate that RSEQ's winner will be the 6 seed. how high to seed Dalhousie if the Tigers go in through the front door as AUS champion. Their win against Ryerson was on the road (good for the Tigers), but it was on the first weekend of October (bad for the Tigers). Carleton (OUA representative): Easy pick. Interestingly, since OUA adopted the single-site Final Four in 2010-11, the Ravens have never hosted. UBC (Canada West champion): 127 points?! The estimable Howard Tsumura, on his final weekend at The Province, summed up just how in the azure hell the T-Birds did that against Brandon last Friday. Hint: they took 78 shots and sealed Brandon off from the O-boards. Ottawa (OUA rep): The Gee-Gees could conceivably finish second in RPI even if they lose against Carleton and Ryerson to finish with a 16-3 conference record, while the Rams finish 17-2. Those points could come from having two games with the Ravens, plus two games with two other teams which each had two games with the Ravens. That was what I was trying to say late last week. Dalhousie (AUS champion): The Tigers are a combined 1-4 against Saint Mary's and UNB and 18-3 against the rest of U Sports. The team with the best pace-setting point guard has a huge edge in single-elimination tournaments and well, Dal has Ritchie Kanza Mata. Calgary / Alberta (Canada West rep): Too soon to say, and Saskatchewan is also in the mix. McGill (RSEQ champion): The Redmen are the default pick to come out of Quebec due to defense; they haven't let anyone break 80 all season, including NCAA teams in exhibitions. Concordia is intriguing; 1-2 against McGill and held its own against mid-level OUA competition in October. Brock (at large): Consider this the spoils of Brock defeating Ryerson last Friday, prevailing 74-65 in front of 3,000-plus in St. Catharines, not a statement of who's better. Most of the RPI scenarios point to the Badgers nestling into the No. 4 spot in the OUA bracket. The team which has to play Carleton on Friday could end up being fresher for a bronze-medal game against the vanquished from a Ryerson-Ottawa semifinal. Ryerson was just off in that game (7-for-37 on triples as they played from behind), and that happens. Their Carleton/Ottawa trip on Feb. 17-18 could be really good preparation for the postseason. Saint Mary's (host): The half of the bracket with Dal also gets the other AUS team for the evening draw on the first night of the tournament.